Driving off-highway vehicles on dirt and unpaved roads stir up particulate matter in the air, adding to our pollution problem. 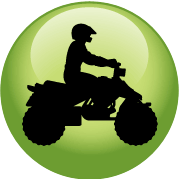 Maricopa County asks riders to be mindful of the desert terrain and Curb Your Dust. Not listed in P-28 but included in Senate Bill 1552 is the following: Restricts the operation of off-highway vehicles in Area A during High Pollution Advisory days for particulate matter.